Indian Bank PO Recruitment 2018 For 417 Posts | Registration Ends Today, Apply Now @ indianbank.in! Exams » bank1 » Indian Bank PO Recruitment 2018 For 417 Posts | Registration Ends Today, Apply Now @ indianbank.in! 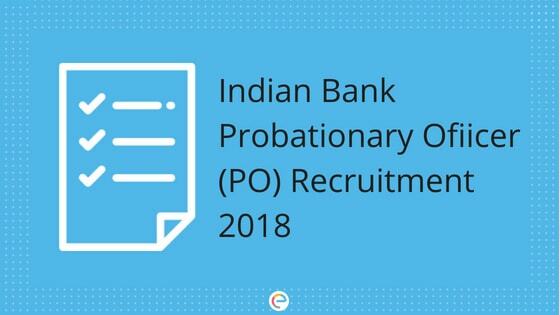 Indian Bank PO Recruitment 2018: Indian Bank is one of the top public sector banks in India with around 3000 branches across the country. Working as a Probationary Officer at Indian bank is highly prestigious and one of the best entry-level jobs for candidates aspiring to work in the banking sector. Indian Bank has released the official Indian Bank PO Recruitment Notification for the 417 posts across the country. As per the notification, selected candidates who fulfill all the eligibility criteria will be given admission to Post Graduate Diploma in Banking and Finance (PGDBF) course at Indian Bank Manipal School of Banking (IBMSB). The online registration for the exam has already started and interested candidates must go through the detailed Indian Bank PO Notification before applying for the exam. In this article, we will provide you with all the information regarding Indian Bank PO Recruitment 2018. Educational Qualification Candidates must have a Degree (Graduation) or equivalent educational qualification in any discipline from any recognized university. Indian Bank PO application form is available online on the official website of Indian Bank: indianbank.in. Candidates who fulfill the eligibility criteria can fill up the application form only in the online mode and apply for the exam. Step 1 Go to the official website of Indian Bank: indianbank.in. Step 2 Click on the “Careers” tab. Step 3 Click on “Click Here To Apply For PO On Boarding”. Step 4 Click on “Click Here For New Registration”. Step 5 Enter your basic information, like name, mobile number, and email ID. Make sure you enter valid mobile number and email ID as you will be notified on various updates only through the registered number and email ID. Step 6 Upload scanned copies of your photograph and signature in the required format and size. Step 7 Enter your personal and academic details. Step 8 Make payment of application fees. Indian Bank application fee can be paid only in the online mode. Step 9 Review your application and submit it. Step 10 Take a print out of your Indian Bank application form for future reference. The total time duration for the Preliminary exam is 1 hour. For incorrect answers, 0.25 of the marks assigned to the question will be deducted. The Quantitative Aptitude and Reasoning Ability sections will be available in both English and Hindi. It is to be noted that candidates will have to clear the cut off marks for each of these sections as well as the overall Indian Bank PO cutoff in order to clear the Prelims and be eligible to appear for the Main exam. In Indian Bank PO Main exam too, except the English Language sections (objective and descriptive), all other sections will be available in English and Hindi. There is penalty for wrong answers in the Main exam as well, 0.25 marks assigned to a question will be deducted for incorrect answers. Also, the Main exam is separately-timed, i.e. each of the sections should be finished within the allocated time. Candidates will have to clear the sectional as well as overall cutoff to appear for Personal Interview. Candidates who clear the Main exam will be called for Personal Interview conducted for a total mark of 100. Final selection will be made based on the candidates’ score in the Main exam (80 percent) and Personal Interview (20 percent). The Indian Bank PO Cutoff for both Prelims and Mains will be decided based on the number of vacancies, total number of candidates and the difficulty level of the respective exams. As mentioned above, there will be two types of curt off – sectional and overall. Candidates will have to clear both the cut offs in order to clear a particular stage. For Personal Interview, the qualifying marks is 40 percent for General candidates and 35 percent SC/ST/OBC/PwD candidates. Indian Bank PO admit card for each stage will be released on the official website. Candidates will have to login to their account using their Registration Number (generated while filling up the online application form) and Date of Birth to download their Indian Bank PO call letter / admit card. The call letter will contain all the information regarding the exam, like date and venue of exam, time, etc. Selected candidates will be enrolled in Post Graduate Diploma in Banking and Finance course at Indian Bank Manipal School of Banking, Bangalore. It is a 9 months course after which candidates will work as interns for three months as any branch of Indian Bank. Now that you know everything about Indian Bank PO Recruitment, pull up your socks and start your preparation. Finish the Indian Bank PO syllabus as early as possible and practice sufficient number of questions for each topic so that you master them. Make sure you take Indian Bank PO mock tests and rectify the mistakes you make. At Embibe, we provide bank PO mock tests for free which will help you in your preparation, to crack the exam with a high score. We hope this detailed article on Indian Bank PO Recruitment helps you. If you have any query regarding Indian Bank PO Recruitment, feel free to drop a comment below. We will get back to you.